While the internet, mobile browsing, and social media have undoubtedly transformed the car sales scene, this doesn't mean that prospective buyers aren't still using the old-school method of phone calls, in fact, it’s the opposite. If your sales team struggles with how to engage with customers via phone and get them to convert to in-person buyers, try these five phone sales tips. It can be tempting not to take a phone call customer as seriously as you would an in-person buyer, but this is a mistake. Even if the person is only calling to find out your "best price" for a specific vehicle or if you have a car in stock, you want to go ahead and put their name in your CRM and make sure to take lots of notes during the call. It can sometimes take a few over-the-phone interactions before a customer finally gets to the point that they're ready to come in for a purchase. If they call back and have to start over with another salesperson because there's no record of the call in the system, this leaves a bad impression and can mean they take their business elsewhere. While your team is naturally focused on getting a sale, they need to make sure it doesn't come across that way to the customer. Focus on a customer-centric conversation and ask lots of clarifying questions about what the customer needs, wants, and is looking for. Instruct your team always to tie everything they recommend about a vehicle to a specific benefit for the customer. These two things help deliver the message of "We're here to help you," instead of "We're here just to make money off of you." Every sales business gets a range of customers, but vehicle sales, in particular, bring in a diverse set of customers, and it's important for your sales team to recognize this and adapt their approach accordingly. While you don't want to necessarily ask a customer a lot about their personal situation over the phone, pay close attention to what they bring up as concerns or buying factors and be prepared to run with it. For instance, a recently single parent may be more concerned with getting approved for a manageable payment due to credit issues, but a retiree may be more focused on finally getting the luxury vehicle they've been dreaming about for decades. It's normal to get a bit frustrated when a customer keeps calling with follow-up questions but hasn't actually made a move to buy yet, but, this is where empathy comes in. A vehicle is a big purchase, and many people struggle with how much money to spend, what's actually workable for their budget, or what vehicle they actually need. Treating potential customers like you would a friend makes it easier to start off from a place of "how can I help here?" and making a personal connection with the customer increases your chances of a successful sale. Sometimes what you don't do when it comes to sales can be just as important as what you do. For example, asking a caller for their contact info "just in case we get disconnected" can immediately put the customer on the defensive thinking they're going to get added to yet another sales list. Same thing with telling the customer they need to come in to get details like pricing. If the person is calling, it's because they don't want to come in, and the reason is irrelevant. Telling them they have to come in is focusing on your convenience instead of the customer's, and that's never a good thing. Engaging with your customers on a personal, relatable level will make an astounding difference in customer perception. By presenting your team as helpful, reliable assets for them, you're building a relationship that will bring them back to you in the future. 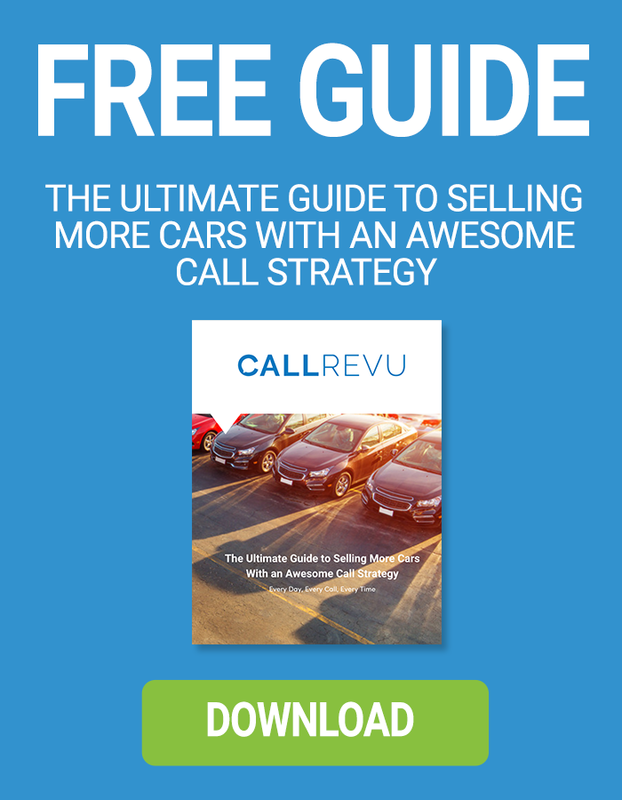 Download this guide to learn helpful, actionable tips to start selling more calls with an awesome call strategy. Remember, if everyone at your dealership isn’t trained on answering questions and directing calls to the right people, you’re missing opportunities and losing revenue!